This youthful-looking singer, songwriter has had a singular vision of entertaining the world with his meaningful tales for nearly two decades. Always a capable writer, he has honed his craft naturally to fit his sometimes folksy, sometimes rock and roll style of guitar playing. While performing in a band originated with his brother and two friends in San Diego in the early 90’s, he also realized the joy of entertaining live. While earning his living in electronics and becoming accomplished in recording arts, he also completed several years of college and delved in making videos as well as developing his own digital recording studio at home. He was raised listening to rock and roll and gravitated to heavy metal in his adolescent and teen years. Now, he is a true music afficianodo sometimes listening to classical music, folk music, and most everything in between. Brandon appreciates the message of a song and the craft of songwriting, as well as the necessary musicianship. He is a natural encyclopedia of information about classic music from the 50’s until now. In fact, Brandon is the grandson of a musician and inherited his love of music, as well as the development of his own talent. His grandfather described himself as, “a sax man” though he also played the clarinet and had his own band from his Army days throughout most of his life. Playing music for Brandon is a hallowed experience and one he takes very seriously. Brandon is very close to his brother and his mother and is also an uncle now twice over. He is very family oriented and indulges his love of the beach. He enjoys living in San Diego, but realizes that “making music” may lead him to places unknown. Brandon is single, never been married, and has no children. His life is a musical score yet to be written, with so much potential. 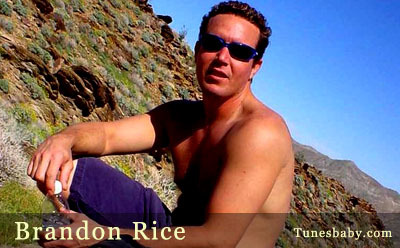 Its just a matter of time before someone special recognizes Brandon Rice, the world will see and hear him pour his life stories into unforgetable memories. Its time to take some risk and let it all ride.